These are all important data structures (read: interview topics). Today we will focus on the Stack. Complete this Activity with a partner. Make sure to answer the CFU questions after you have worked through the examples. If you finish early, work on the bonus activity at the end of the README. Clone this Repository. With a partner, trace through the program line by line when you run runner.rb. Notice that whenever a method finishes running, you have to go back to where it was called from to continue tracing through the program. It can be difficult to follow this sequence between 3 or 4 method calls. How does the computer manage it when there are potentially hundreds of nested method calls? In order to manage the flow of execution between methods, the Computer keeps track of The Call Stack. This stack is so omnipresent we often refer to is as The Stack. Stacks are really good at problems that involve nesting or ordered execution, as we saw in the “check it” example. Keeping track of method calls is a perfect application of stacks because methods also nest inside each other. When a method calls another method, the outer method needs to wait for the inner method call to finish before it can resume. The Call Stack represents each method call as an element on the stack. This is called a Stack Frame. Create an index card for that method (if you don’t already have one). This is a Stack Frame. Push the new Stack Frame onto the Stack. Turn and Talk - Looking at the Homeward Bound code, find examples where we are saving the return value of a method. We know that methods don’t just execute, they also return values. Every method has a return value, but that return value isn’t always used. Note that we are including any arguments to the method as a local variable since they function like local variables. Notice that whenever you pop a stack frame, any local variables that were part of it are lost. Another important piece of context the Stack Frame keeps track of is the value of self. Self refers to whatever Object is executing the method. So in the example above, when we call chance.chase, because chance is a Dog object, inside the chase method self refers to that Dog object. Work through this Example using the rules we defined above to model The Call Stack. One person should be in charge of moving and filling out the sticky notes. The other partner is in charge of the index cards. When you have completed one pass through the example, switch roles. 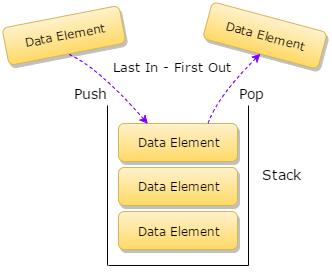 What is the Stack data structure? What are the rules of interacting with a Stack? What is The Call Stack? How does it work? What is a return value, in terms of The Call Stack? When an error occurs, how does Ruby create the Stack Trace?